More and more classes will be added in the coming months and the link to each class is listed below. Making beautiful cards has never been easier than with the use of dies. Once you have paid for your class look very carefully at your PayPal receipt. You will need to keep these "Thank You" pages safe on your PC and in a file where you can remember them as this is what will give you access to the class. When you start collecting Spellbinders it is always a good idea to have some Accents dies with the matching Motifs. That way you can get more use by mixing the dies from both sets together to create different patterns. I have started this first class is using the Asian Accents and Motifs to give you three very different looks to your designs. 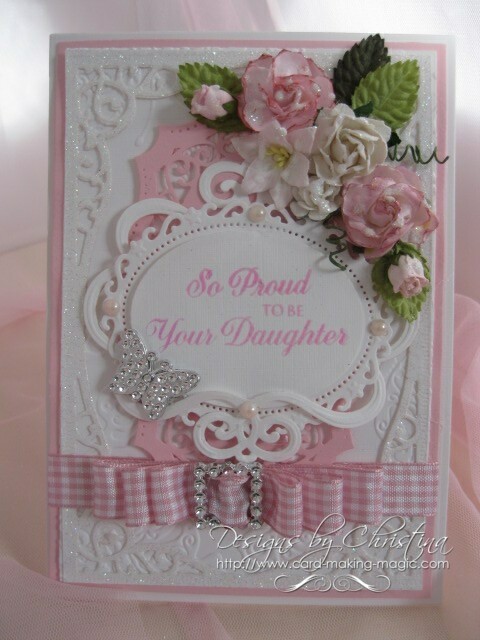 Spellbinders make their collections with many matching dies that can all be used together. Instead of buying dies randomly look at the ones you like and see if there is a matching die that will enhance it. Spellbinders are a considered purchase ... but they are also addictive and once you start collecting and see all the beautiful new shapes and patterns that come out each season you will want more .... ask me how do I know this ??? But being ever mindful of the cost we need to get as much use out of the ones we have in our collection and so for this third class I am going to use the same sets of dies as we used in the other two classes. Over the last few classes we have put to good use Spellbinders Die sets and we have used them in different ways to get the most for our money. In this class I am using the Grand Large Labels to create the card bases for three more cards and I am going to introduce the use of some pretty flowers to make your cards very feminine. Ready for another class in using your Spellbinders ?? This one shares with you how to get texture into your designs and also introducing the background dies that can add even more interest into any card that you create. Many of these background dies are extendable giving you even more options when using them. Along with the other dies in our collection the background die that I have used is the ..
but there are several that Spellbinders have created for you to choose from.